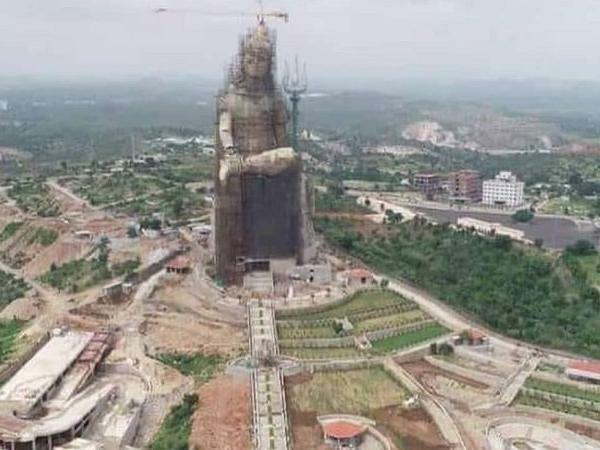 India will see Tallest Lord Shiva Statue in the World. Sardar Vallabhbhai Patel's single statue of steel man has further enhanced the country's fame. It's all set to make another world's tallest statue behind it. 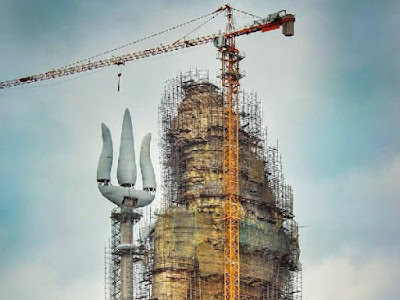 The 351 feet high Lord Shiva Statue is being installed at Nathdwara in Rajasthan. It is the Highest Lord Shiva Statue in the world. The statue will be inaugurated in March 2019. Started on August 18, 2012, the foundation of the statue was installed. The then CM Ashok Gehlot was buried by Blessed Murari Bapu. Now 85% of work is completed. The Speciality of World Tallest Lord Shiva Statue. Continuous perseverance for 4 years by 750 workers. The Statue deserve fame of World's Tallest Lord Shiva Statue. The statue of Lord Shiva is headed to a height of 351 feet. ShivaStatue face is about 70 feet long. Shiva Statue waist rises to 175 feet high. Shiva Statue knee is at 150 feet high. 3000 tonnes of Steel use for Statue. The Statue weigh up to 30 thousand tonnes. Three escalators are being installed in the system of four lifts to visualize the statue. You can see Statue from 20km away. Theater and Garden facility are Available.